It’s an article of faith for political organizers: there are no permanent enemies. It’s encouraging to think that we can form and re-form alliances, and there is scriptural support for this idea. I suppose the converse is true, too. 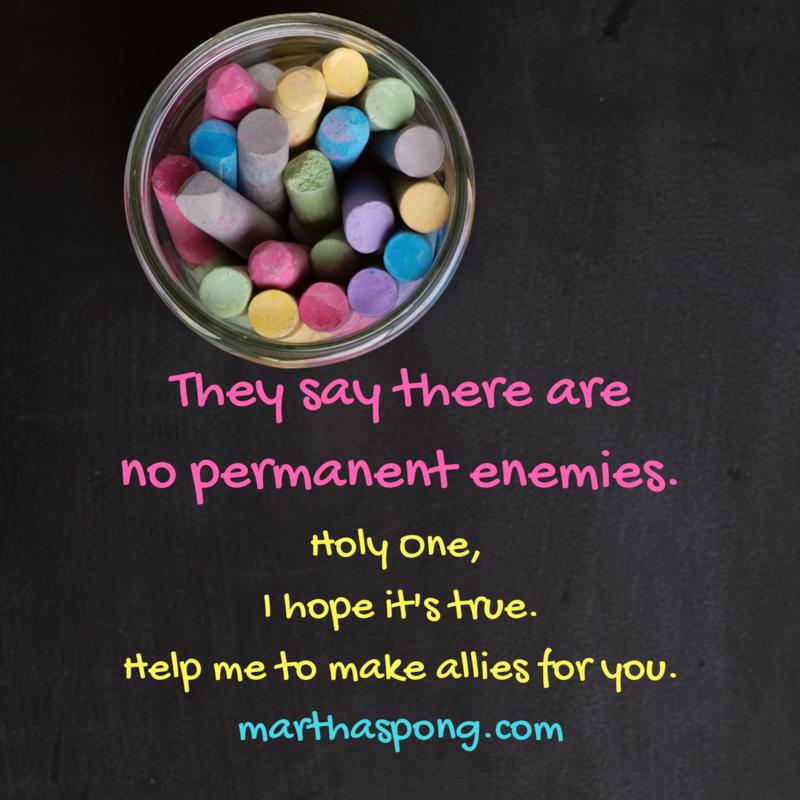 There are no permanent allies. That’s discouraging. I would have liked to think that we could trust our allies, but one of the things I’ve found since coming out in 2012 is that some people are with you only up to a point. One of the best pieces of advice I received in the midst of that personal and public process was to prepare to be surprised by the people I counted on who would let me down and amazed by the people I never expected to support me who would. No permanent enemies, and no permanent allies. In the town where I live, as in many towns in this era of religious and political polarization, the churches have a hard time coming together to do any kind of useful work not just over the ordination and inclusion of LGBTQ+ people but over the ordained leadership of women. Seriously? To me, that seems pretty 1957, but it’s real around here. I’ve heard my spouse say she will graciously stay out of the way if they manage to have some kind of multi-church worship service, as long as some other women are visible in leadership. It makes me feel like I live in the wrong place, but then I have to remember how called we felt to be here when we discerned whether one of us would relocate, and whether we would get married. I tell myself that there may be powerful acts done by some of those churches, feeding hungry people, healing broken hearts. Yet I know there are youth in some of those congregations being taught that people like me are going to hell, and I know they are menacing LGBTQ+ students and allies in our local schools who do not agree with them. I want to think that just by being here as ordinary people in an ordinary community we may help shift the way people ally themselves. I hope it’s true, in the end, that no one who does good in Jesus’ name can reject the love he lived. Holy One, I hope it’s true there are no permanent enemies. Help me to make allies for you. Amen. I’m reading and blogging about Mark for Lent. Want to read along? I’m using the Common English Bible because it messes with my expectations of familiar passages. I am also referring to NRSV-based resources including The Jewish Annotated New Testament, and the New Interpreter’s Study Bible, as well as the online Greek interlinear Bible.